I hereby proudly announce that my first book has been published at packt publishing. Processing 2: Creative Coding Hotshot will present you with nine exciting projects that will take you beyond the basics and show you how you can make your programs see, hear, and even feel! With these projects, you will also learn how to build your own hardware controllers and integrate devices such as a Kinect senor board in your Processing sketches. Processing is an exciting programming environment for programmers and visual artists alike that makes it easier to create interactive programs. 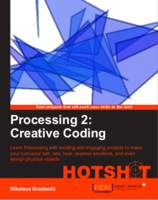 Through nine complete projects, "Processing 2: Creative Coding Hotshot' will help you explore the exciting possibilities that this open source language provides. The topics we will cover range from creating robot - actors performing Shakespeare's "Romeo and Juliet", to generating objects for 3D printing, and you will learn how to run your processing sketches nearly anywhere from a desktop computer to a browser or a mobile device. Using a project-based approach, you will be able to learn the coolest aspects of working with Processing. Each project contains step-by-step explanations, diagrams, screenshots, and downloadable material to make learning Processing even easier. This book targets Processing developers ,visual artists, creative professionals, and students who want to move to the next level of learning Processing for gaining inspiration, work, or just for fun. The book assumes a basic understanding of programming. However, this book is also recommended to non-artistic readers, looking to expand their graphics and develop their creativity. Hi Nikolaus. I got this ebook the other day, as I was really into the last chapter on 3d objects- great tutorial btw. Can you shoot me an email to discuss some things about making some other shaped objects, and viewing .stl files in processing? I have made the mission in chapter 6, chapter 3 and now I am trying to complete chapter 2. I successfully completed the first exercise in chapter 2 and the in the second exercise I kept getting an error: cannot find anything named "SimpleOpenNi.SKEL_PROFILE_ALL" when I reduce the code to context.enableUser(); I then get an error; the function getUsersPixels() does not exist. Can you help? Hi, my name is Jose from spain watching your work on your web local guru it seemed very interesting to me, i was thinking making a kind of document (a pdf or html) that could be downloaded to study it offline. much based on your works on local guru and the works of blender sushi, plus Liero posts in blenderartist . It would be free to download to make it easiest to study itfor people whith bad or no web access around the world. You think is an interesting idea?